I don’t actually think a lot about Down syndrome these days. Penny is 13. She’s healthy and happy and learning and growing. We couldn’t be more grateful for her. And it is increasingly challenging to figure out how to tell her whole story while also honoring her privacy and personhood. But for some reason, World Down Syndrome Day was a spark for me, and I wrote three different essays, which have been published in three different places today. First, in honor of Penny, I wrote an essay for the Washington Post about the ways she has opened my eyes to the reality of privilege and exclusion and the chance to participate in healing social harms. Here’s a taste: “But something else happened as I got to know my child. I stopped wanting Penny, and other kids like her, to be shoehorned into my world of privilege. I began to see Penny’s life as an invitation to step out of my fenced-in existence. I read theologians of disability, such as Jean Vanier, Hans Reinders and Henri Nouwen, who wrote about vulnerability as a gift we give one another, a way of expressing our humanity through love and through recognizing the inherent value of every human.” Read more here. Last fall, I had a conversation with William about college. It was premature, I know. He’s ten. But it was a conversation about how he doesn’t need to go to a top-tier school. And in fact, about how it would be awesome if someone from a less advantaged background is able to go to that school instead. I have become increasingly aware of the fact that kids like ours–kids with white, married, affluent, educated parents–already have a tremendous advantage when it comes to their own education. And also increasingly aware of the dangers to those affluent, educated kids when life becomes a pressure cooker headed towards endless achievement. The scandals last week about parents bribing their children’s way into schools only underscored my own thoughts. Our family has a legacy of college admissions at “prestigious” schools. We also have a child with Down syndrome who has provided a different way to view value, success, and purpose. I had a chance to write for the Hartford Courant today about how having Penny in our family has affected our view on “success”. I write, “Penny will not enroll at Yale or Princeton, but she has offered us a chance to begin a different family legacy. Penny, like many people with intellectual disabilities, does not move quickly or efficiently. She will never take the SAT. She struggles with many abstract concepts. And her presence in this overachieving family has served as an invitation to us all.” Click here to read more. Finally, I’ve been struck recently by the fact that Penny has a positive perspective on her life even as her life gets harder. Even in the midst of the reality of middle school–social rejection and loneliness and identity formation–she is loving and kind (and sad and moody). So I wrote about that dynamic, about happiness in the midst of grief and joy in the midst of sorrow and an embodiment of patient love that I hope one day to learn, for the Christian Century. As I write there, “If this is what love looks like, then I have spent much of my life rejecting love. I have been too busy and too careless to be inconvenienced, challenged, slowed down by it. I have been too ready to grab knowledge rather than receive wisdom. I have been too eager to prove myself, to receive accolades rather than turn my gaze beyond myself to the beauty of my neighbors.” Read the whole story here. 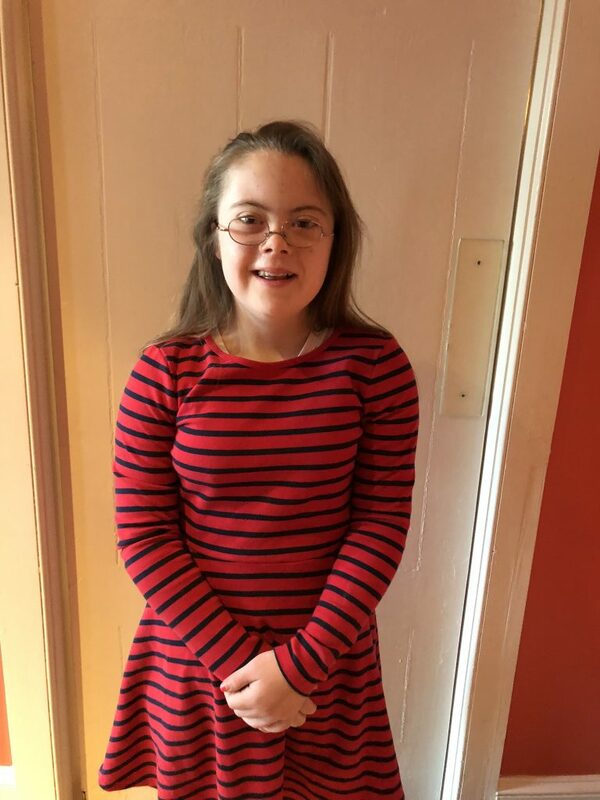 Thirteen years ago, I might have been surprised to think of saying “Happy World Down Syndrome Day,” but I say it today with sincerity and immense gratitude that I have the privilege of raising our daughter. Thank you for sharing about how Penny has been a gift to your family. I have a beautiful granddaughter with and extra chromosome. She is our teacher. We love her deeply. Is there any way I can have a web site to your article in the Hartford Courant, please?